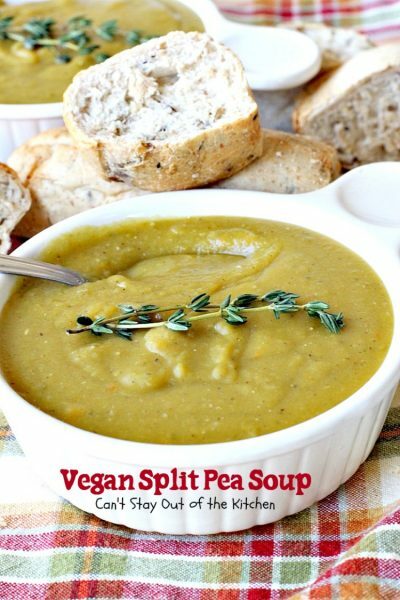 Vegan Split Pea Soup is sensational. Really. I loved this soup! It was amazing. I’ve never eaten split pea soup without ham or sausage before so I was wondering if this recipe would have enough flavor. Boy, was I wrong! This hearty Vegan Split Pea Soup is so flavorful. I will make this soup over and over again because it is SO good. 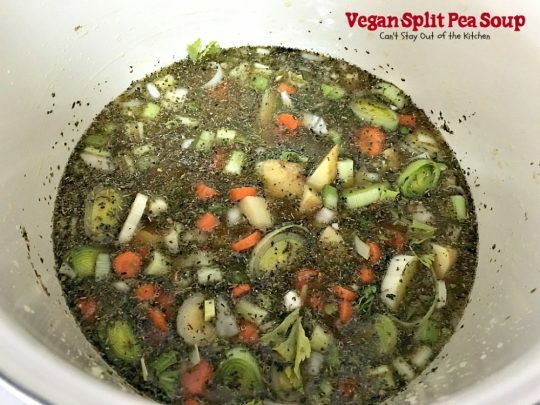 I found this spectacular vegan soup recipe at Vegan Soup Recipe.com. I adapted it by increasing all the seasonings substantially which gave this soup such a tasty savor. This recipe makes A LOT! About 7 quarts when completely finished so this will make 15-20 servings! I’ve never used liquid smoke in a soup recipe before but the combination of seasonings and flavors in this soup worked amazingly to provide great taste. I highly recommend this soup for family gatherings. But this is a great recipe to take to families in need of a meal. It makes so much you can divide it in half for your family and give the rest to someone else who needs a meal. Or you can freeze part of it and have it at a later time. You will love the flavors and the thick consistency and texture of this great soup. 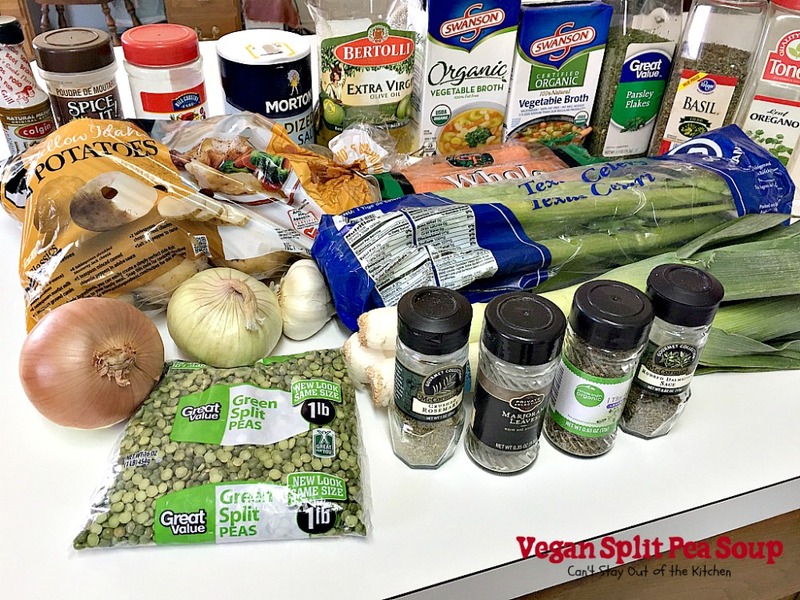 This vegan recipe is healthy, low calorie, gluten free, and stocked full of vegetables which are beneficial for you and your family. 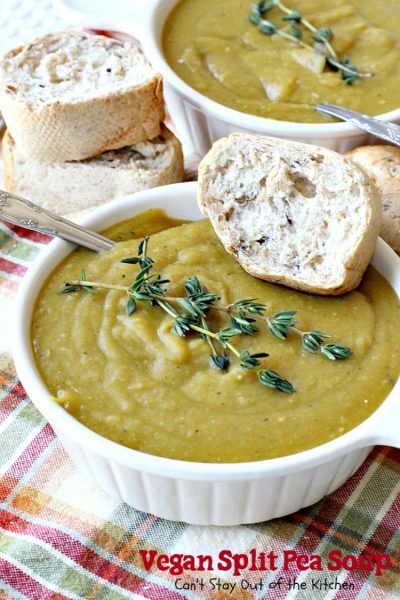 You may want to consider adding this fabulous soup recipe to your repertoire of soups. It is comfort food at its best. Enjoy! When I initially posted this recipe in November 2012, it was in the first year of my blog when I was still using an iPhone for a camera. My pictures were dreadful so I’ve been remaking all those first year blog recipes so I can retake the pictures and get more appealing photos of each recipe. I recently remade this recipe (February 2016) for a lunch with a friend. For health reasons, she needs gluten free, sugar free and dairy free food or she gets a tremendous amount of inflammation and pain. She loved this soup and I have to say, it is one of my favorite soups. Vegan Split Pea Soup is one of the best Split Pea Soup recipes I’ve ever eaten. 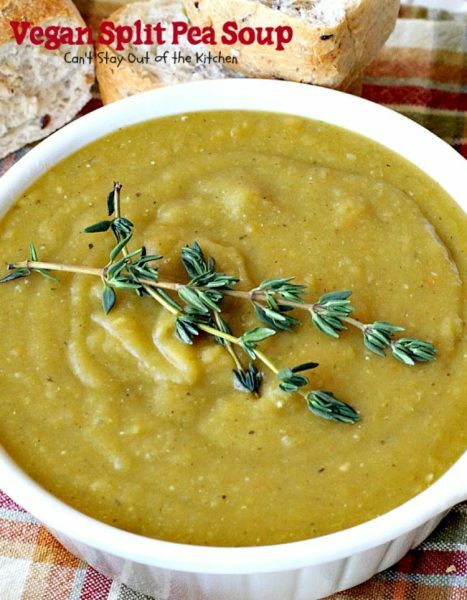 Every bite of Split Pea Soup is mouthwatering. 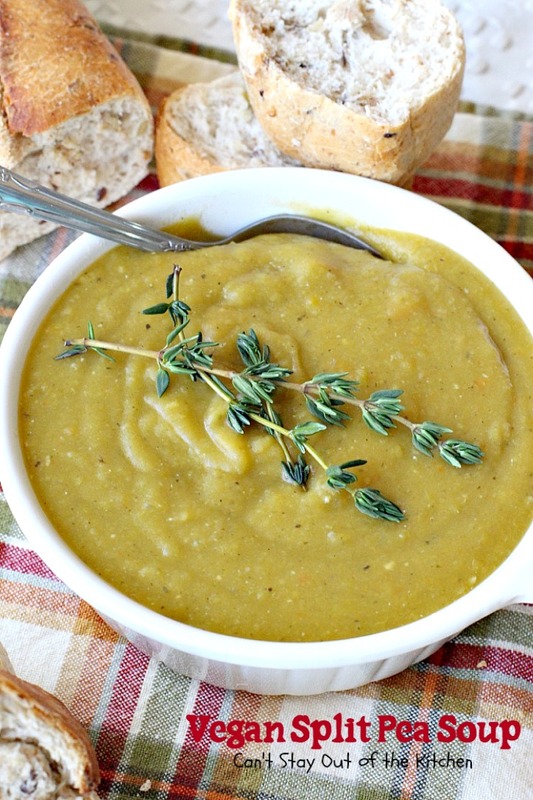 Vegan Split Pea Soup is excellent garnished with extra salt and pepper, parsley or thyme. Serve with your favorite bread. I used these ingredients plus a one-pound bag of split peas for this recipe. Place a package of dried split peas in a bowl and fill with water to make sure peas are completely submerged. Soak for at least 2 hours. Soaking legumes and grains releases phytates which are harmful, and also being an enzyme process to help make them more easily digestible. I highly recommend you soak all whole grains, (wheat, rice, corn, etc.) and legumes before cooking. After beans are finished soaking prepare the rest of the soup. Chop up onions and celery, slice carrots, leeks and cube potatoes. Mince garlic. Put all the veggies into a large stockpot. Add seasonings, olive oil, soaked split peas and Liquid Smoke. Bring soup ingredients to a boil and cook for 5 minutes. 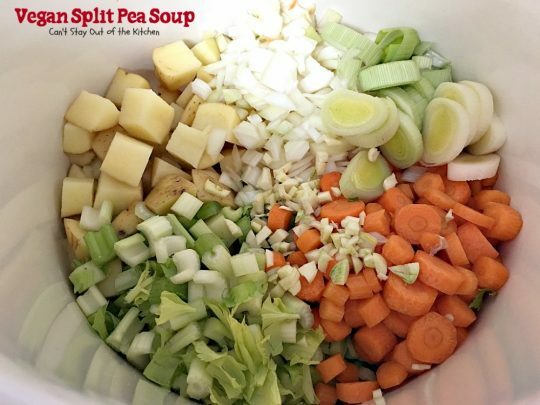 Reduce heat to medium-low and cook at least an hour to an hour and a half – until the vegetables are fork tender and split peas have cooked. Puree the soup mixture with an immersion blender until smooth. Garnish soup with fresh thyme and and serve with bread, oyster crackers, croutons, or plain. 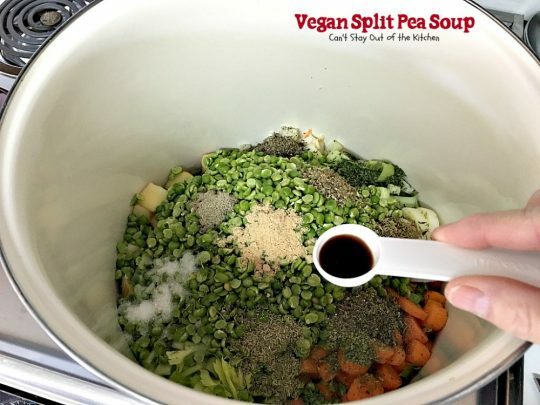 Vegan Split Pea Soup is healthy, low calorie, gluten free and vegan making it a wonderful meal for anyone trying to eat clean or lose weight. 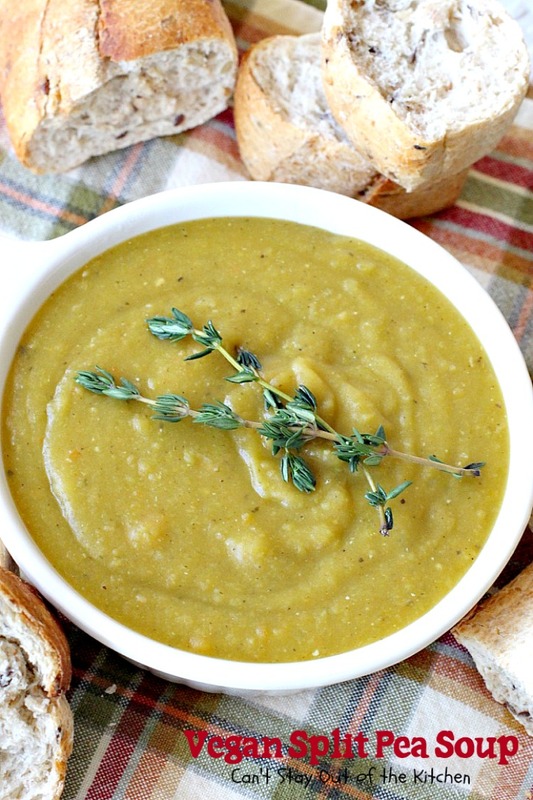 This is one of the best Split Pea Soup recipes I've ever eaten. The flavor, seasonings and consistency is wonderful. Check the split peas for stones and remove. 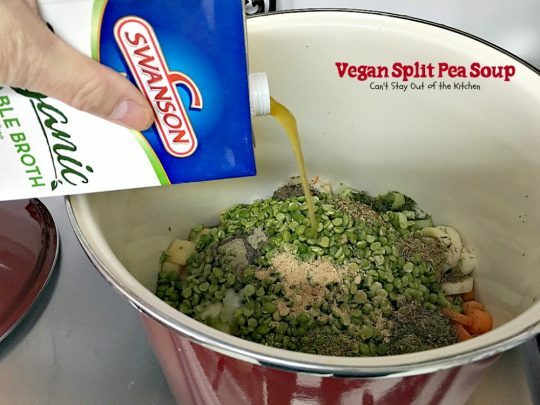 Place peas in a bowl and fill with water. Soak for a few hours. Once peas have finished soaking, chop the onions and celery. Slice the carrots, leeks and cube the potatoes. Put all of the ingredients (except crackers and garnish ingredients) in a 10-quart heavy bottom pot, and bring to a boil for 5 minutes. Reduce heat to medium-low and cover loosely. If necessary, add water to keep the vegetables submerged. Cook for at least 1 to 1 ½ hours or until veggies are fork tender. Add salt, pepper or seasonings as desired. Purée the soup with an immersion blender until completely done. To serve, ladle soup into bowls. Garnish soup with salt, pepper, and parsley or thyme. Serve with oyster crackers or bread, if desired. NOTE: Preparation time does not include time needed to presoak the split peas. Recipe adapted from Vegan Soup Recipes. 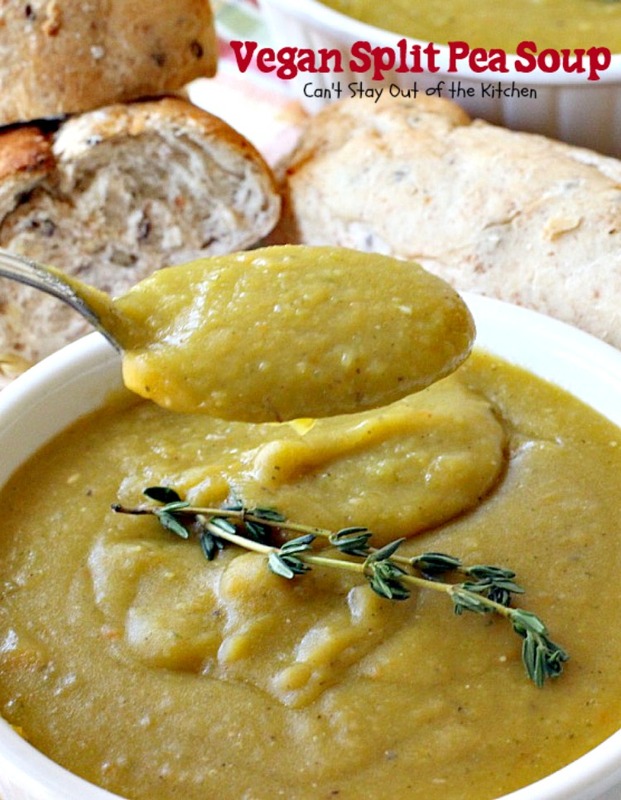 This is one of the best Split Pea Soup recipes I’ve ever eaten. The flavor, seasonings and consistency is wonderful. Serve with oyster crackers or [url href=”http://cantstayoutofthekitchen.com/2016/01/13/garlic-herb-french-bread/” target=”_blank”]bread[/url], if desired. Preparation time does not include time needed to presoak the split peas. 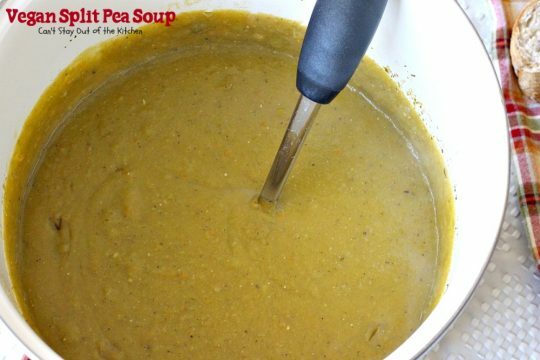 Vegan Split Pea Soup is a fabulous comfort food recipe on cool weather nights. Come join me in a bowl of this hearty and tasty soup. Seemed to be lacking something. So I left it on the warmer and threw in a ham hock. I’ll see if this helps my palate. Hi, Ginger. We thought it was really tasty for a vegan soup. I had plenty of pepper in mine. I also have a regular split pea soup with ham on my blog that you might prefer. 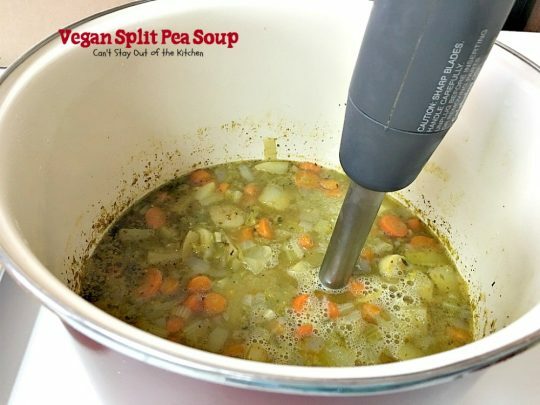 Made this split pea soup (vegan style) according to the recipe exactly as written. It is super delicious!! Thought it would be time consuming because of long list of ingredients but it wasn’t as complicated as I thought! My family loved it! The recipe does make a lot of soup but we will eat it up with no problem!! Thanks for a great recipe!! Thanks, Mary, so glad to hear your family all enjoyed it. It’s a great soup for leftovers, too! Sorry Stacey, I don’t have a calorie counter on my blog. But you can import the ingredients to an online counter and get the amount that way. Thanks for stopping by. I hope you try this recipe. It’s really delicious. I am so glad you saved a bowl for me! It is SO good. I had two bowls of this today! Come on over!